Thank you, Ace Hardware, for partnering with me on this post. All thoughts and opinions are my own. When we remodeled our house last summer the dining room was the only space we didn't touch. It's the first room you see when you walk in the front door and I wanted to give it more of a wow factor but was stumped on what to do. Any ideas I had were shot down because we had so many other projects going on with the kitchen, bathrooms, and closets - not to mention a baby on the way! Here we are about a year after wrapping up the big projects and I have the itch to finally give our dining room a much needed face lift. The room itself is on the darker side so I was worried if I painted the whole room a bold shade it would feel very closed in. Earlier this month I visited my local Paint Studio at Ace Hardware and talked to one of their paint associates about the project. I showed him the Clark+Kensington paint colors I loved but we also discussed my concern about the darkness of the room. He was incredibly helpful and talked through the project with me. After brainstorming and looking through inspiration photos, I decided to add a paneled chair rail. This way I could have the colorful room I wanted but the white paneling would balance it out! I absolutely love how much interest it adds to the space. 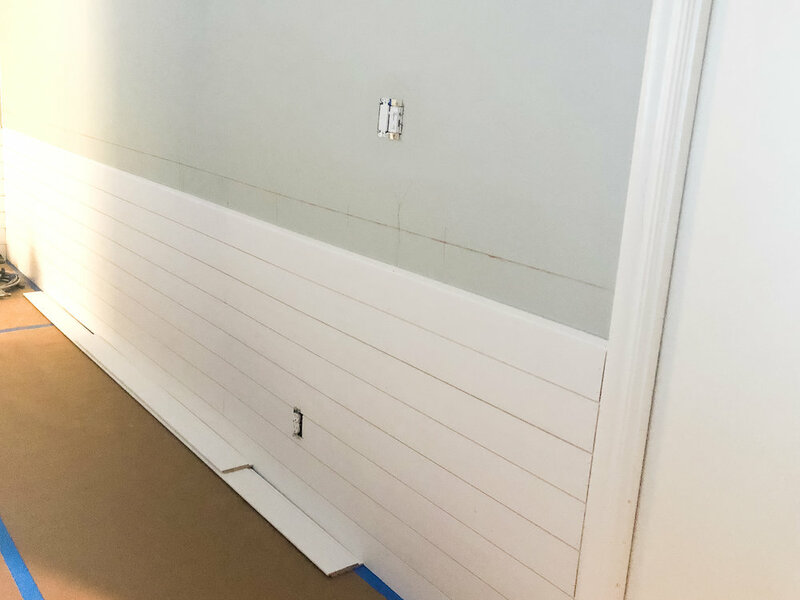 We chose Clark+Kensington Artistic Blue (35C-7) for the upper part of the walls and Clark+Kensington Silent White (CW-C1) for the paneling and trim. The finish for both colors is eggshell. I've always been a little hesitant about having white walls but the Clark+Kensington interior paint and primer is stain resistant and easy to clean. Both were a huge selling point for me because I know Piper's little fingers will be touching the walls in a matter of days! Scroll down to see some before shots of the room. Keep in mind the chandelier is coming in the wrong place. I decided to rearrange the room a couple months ago to try and give it new life but didn't want to move the light until I was really sure I liked the set up! I hired a contractor/painter to help with this project. I didn't think the paneling was going to take as long as it did but then again, it is a big room. They covered all the nail holes and seams for a cleaner more finished look. I've seen inspiration images both ways but I love the style over rustic. We added two pendant lights on the either side of the Art by Megan painting to frame out the bar area. We also added trim around the large window to give it a more finished look. Before the makeover we had blinds and curtains on the window but I've decided to forego traditional blinds and I'm adding a roll up shade so we can close it in the evenings. I love the amount of light coming in without the blinds so this is a great alternative but still provides privacy when you need it! I'll share more photos once we get this installed. It truly is crazy what a huge difference paint makes. 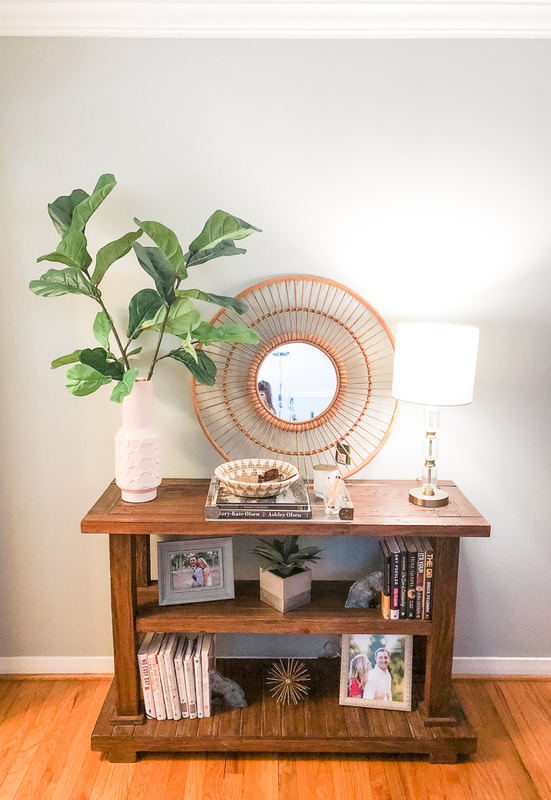 Before this space just felt like a big rectangle but now it has character and makes a statement when you first walk in our house! I couldn't be happier with the finished product. If you have an upcoming paint project you're dying to tackle but it feels a little overwhelming, I highly recommend making a trip to The Paint Studio at Ace Hardware. To find the closest Ace location, click here.